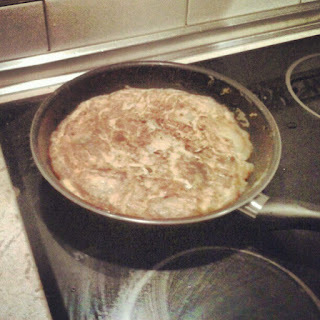 The other day I had a big craving for some tortilla española—Spanish potato omelet—with the memory of tortilla from Casa Santos in Córdoba, Spain, still fresh in my mouth. Since cooked eggs (apart from boiled ones) don’t keep too well in the fridge, there was no way I was going to make a family-size tortilla using a traditional recipe. So, I decided instead to make what I am calling a Personal Pan Tortilla, inspired by Pizza Hut’s Personal Pan Pizza. There’s nothing really original about the recipe; it’s basically a normal tortilla with the number of eggs and potatoes reduced. Spanish cuisine may not be very spicy or exotic, but it is comforting and savory. I hope you enjoy this warm and simple representation of Spanish cooking. Peel and slice a potato into thin disks and whisk 2 eggs. Fry the potato slices with a lot of olive oil until easily pierced with a fork, and put into the mixing bowl. Drain off the used oil, clean the pan, and pour a tablespoon back in. Pour the whisked eggs over the potatoes and onions and egg, add the spicy paprika as well as salt and pepper, and mix. Pour the tortilla mixture into the frying pan and cook on one side until set. Cook for a few minutes and serve with mayonnaise. When cooking for one person, how have you tweaked your favorite recipes so you don’t make a week’s worth of food? And where do you stand on the onions-in-tortilla debate? Comment below!